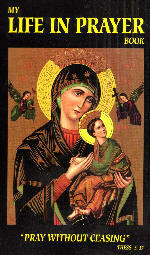 DEVOTION TO OUR LADY OF PERPETUAL HELP. O Mother of Perpetual Help! thou art the dispenser of all those gifts which God grants to us miserable sinners, and for this end He has made thee so powerful, so rich, and so bountiful in order that thou mayest succor us in our misery. Thou art the advocate of those sinners who are more miserable and abandoned than the rest, and who have recourse to thee. Into thy hands I place my eternal salvation, and to thee I consign my soul. I wish to be numbered among thy most devoted servants; take me under thy protection, and it is enough for me. For if thou protect me, I fear nothing, neither from my sins, because thou wilt obtain for me the pardon of them; nor from the devils, because thou art more powerful than all hell together; nor even from Jesus Christ, my Judge Himself, because by one prayer from thee He will be appeased. But one thing I fear, that in the hour of temptation I may, from extreme negligence, fail to have recourse to thee, and thus perish miserably. Obtain for me, therefore, the pardon of my sins, final perseverance, and the priceless gift to love Jesus Christ, and ever to have recourse to thee, O Mother of Perpetual Help!